Hook and Ladder Heatwave is also a similar situation in that the Hook and Ladder Heatwave was released without his trailer but not individually. It's the same Heatwave from the Griffin Rock Rescue Team Set four-pack that also included the essentially re-releases of Rescan Blades, Boulder, and Chase. I also saw the regular scale rescan of Chase as a stegosaurus. I also saw this big honking thing and laughed. First time poster. Enjoyed skimming through the thread. My little guy (3 years old) is obsessed with rescue bots. Question: Anyone know when the new Salvage and Hightide will be available? And will they be the big Energize size? My guy has the smaller Griffin Rock Rescue Team size (rescan size). Talked to Hasbro via chat, they cancelled both of them. 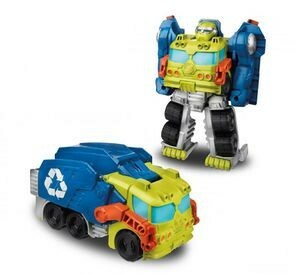 "It looks as though the Playskool Heroes Transformers Rescue Bots Salvage, item #B7459 was cancelled and is not shipping. I do not have any indication that it will start shipping either, I'm very sorry. They are part of the same assortment and the assortment was cancelled. This is why we do not provide dates to consumers because the product can be dropped completely. It is a marketing decision." A new Seibertronian, Card, did some investigative journalism for us in hope that he would get answers regarding when the new Rescue Bot transforming Salvage and Hightide would be available. His son is quite a fan of the toyline and as any good father would, he got to the bottom of it and shared us what he learnt. Card wrote: Talked to Hasbro via chat, they cancelled both of them. For those curious as to what exactly these toys are, we have images below. Both Salvage and High Tide are based on previous toys but changed to either be up-scaled or unhindered by a previous gimmick. They were going to be another Amazon exclusive "wave" at one point, which we never got. These toys never being released gave us the presumption that they were cancelled for the US market but now we know it as a fact. However, this does not mean that these toys were never found elsewhere globally since we were able to find some listings from Asia for the High Tide figure. You can also see an image of that completed listing below. I have a very uncomfortable feeling that this is what's going to happen to the general retail release of Grotusque. Here's hoping I'm proven wrong. Such a bummer. Salvage looks like he would have been fun to transform. But then again I don't know the technical end of it. Might have been costly or somehow flawed. Lore Keeper wrote: I have a very uncomfortable feeling that this is what's going to happen to the general retail release of Grotusque. Here's hoping I'm proven wrong. New Transformers: Rescue Bots Toys Listed On Entertainment Earth! 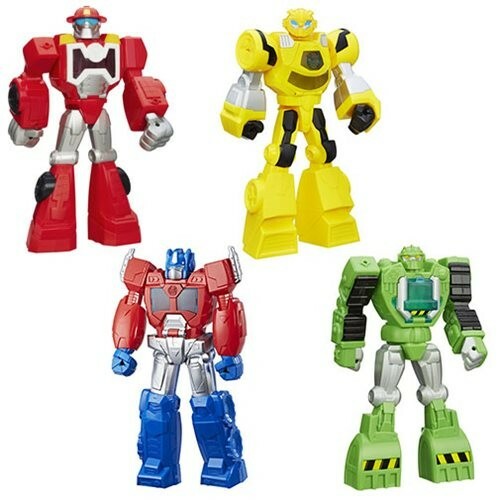 We ring in the new year with some brand new Rescue Bots toys listed on Entertainment Earth. For Starters we have a selection of Rescan figures for Wave 18. We have included an image below as well as the case distribution below. There aren't any Decepticons around, so it's time for the Rescue Bots to save the day! Under the command of Optimus Prime and Bumblebee, this crack squad of robots is here to help save the world, and to give kids a great, big, chunky transforming toy to play with. Figures each measure approximately 5-inches tall in robot form. Ages 3 to 7. Next, we have Transformers Rescue Bots Epic Figures Wave 5. These appear to be non transforming figures for kids, but again we give you an image and the case distribution information to see for yourself. 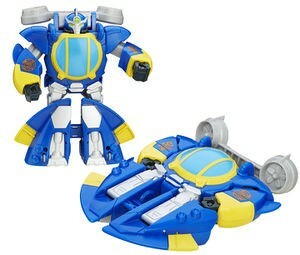 Lastly, there is a figure entitled Transformers Rescue Bots Bumblebee Rescue Guard. Alas, there is no image yet for this figure. The only hints we are given are in the product description, so keep your optics open for when we find out more details! Get ready for adventure with the Transformers Rescue Bots Bumblebee Rescue Guard! Playskool Heroes are the perfect toys for tiny hands, and Bumblebee is the perfect hero. This yellow autobot is ready to save the day - and is here to make playtime fun! Heatwave as a race-car like Blurr? He won't be happy with that. 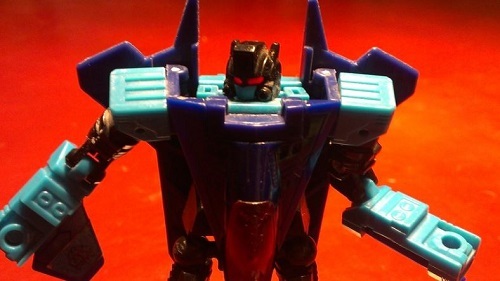 Deathsanras wrote: Heatwave as a race-car like Blurr? He won't be happy with that. Whatever it takes to add to my heatwave shrine. 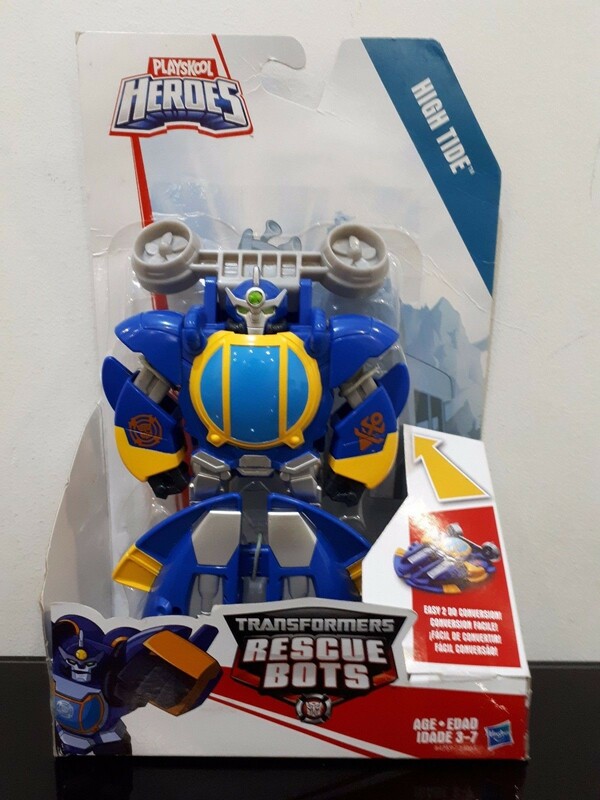 Also from regular Weibo source tf-factory this weekend, we have an image for a potentially new addition to the Transformers Rescue Bots toylines - or maybe even the new animated series being developed by Boulder Media, Rescue Bots Academy - in the form of Optimus Primal. Except this time (as we have seen before in the series' depictions, and as a recurring theme for the cast) Optimus Primal is a red and blue Tyrannosaurus Rex. 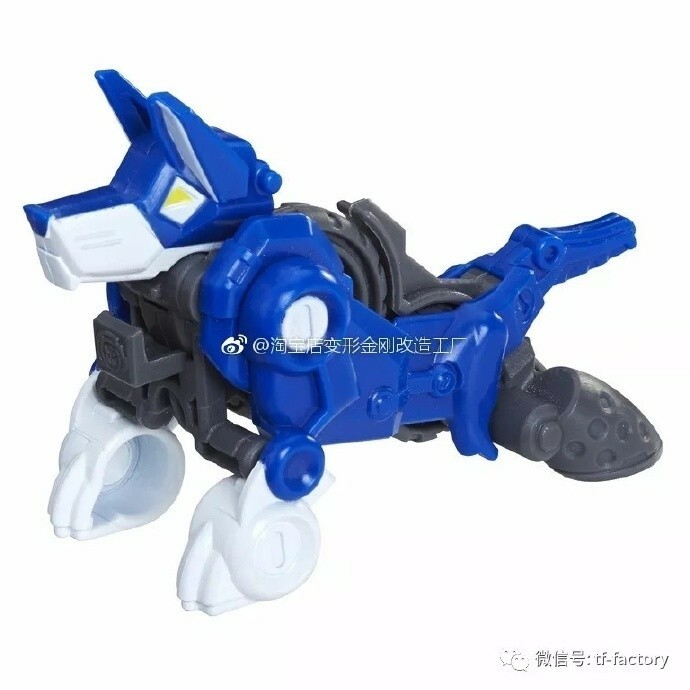 The big (dino)bot seems to be making a return with a different transformation pattern, looking at the panel lines in the image, and is bringing along two smaller dino figures as potential accessories for Optimus, and another figure: a blue wolf with a motorcycle alt-mode, which is apparently the same as Growl the K-9 Bot, previously released with the Griffin Rock Police Station. Check them all out below! 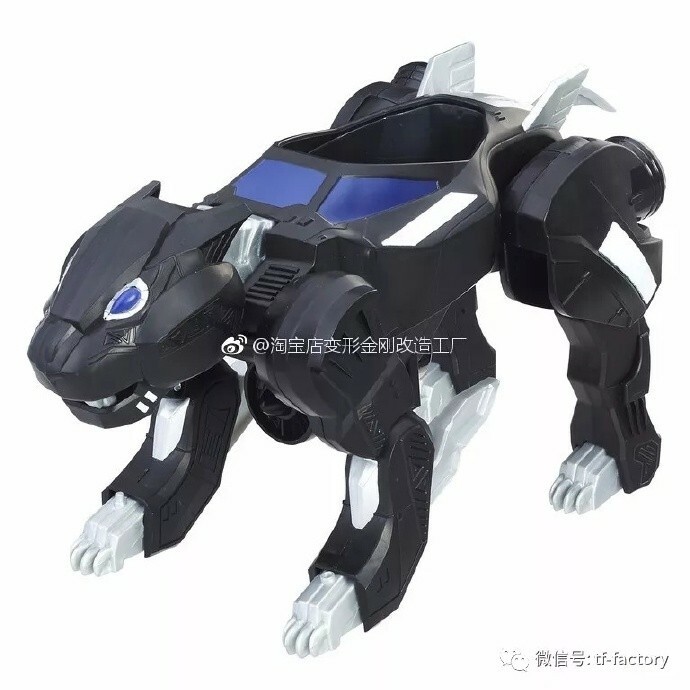 EDIT: The jaguar is in fact a panther, from the Marvel Black Panther toyline, and nothing to do with Transformers. Apologies for the misreporting. Little ones are going to have so much fun hitting each other with that dino! That Jaguar thing is a Black Panther toy, is out at retail now. I saw a bumblebee of the same size class at Meijer the other night. Hellscream9999 wrote: That Jaguar thing is a Black Panther toy, is out at retail now. I saw a bumblebee of the same size class at Meijer the other night. AAAnd to the edit! Thanks! All I wanna know is if that Optimus transforms or not. Otherwise, I'm good with the previous big T-Rex Optimus Primal toy that they made before. I would say that he does transform as there is detail on his underside that looks very robotish. Interested to see what that Optimus Primal looks in robot mode. Sabrblade wrote: All I wanna know is if that Optimus transforms or not. Otherwise, I'm good with the previous big T-Rex Optimus Primal toy that they made before. 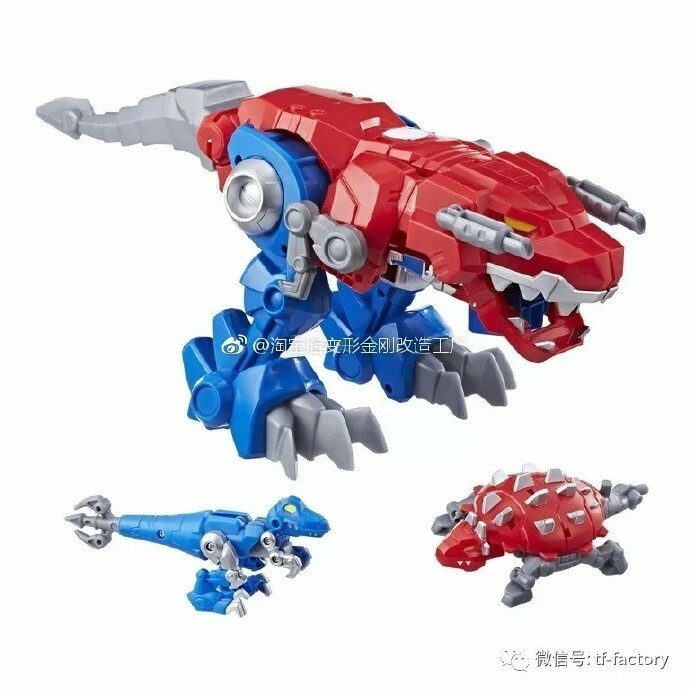 "The big (dino)bot seems to be making a return with a different transformation pattern, looking at the panel lines in the image"
I'd like to get Growl now that he doesn't have a whole playset attached. 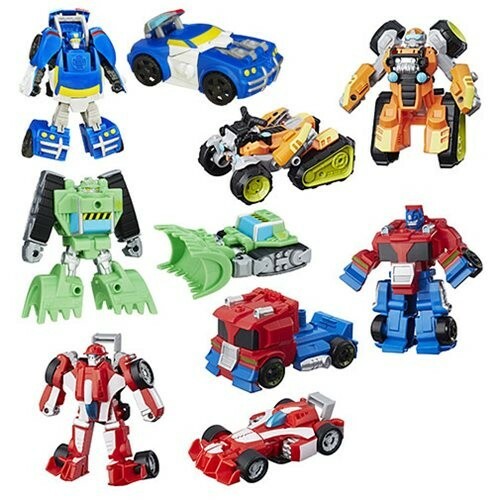 Courtesy of online retailer Amazon.com, we have some new listings for figures yet to come from the Transformers: Rescue Bots, featuring the likes of Bumblebee (twice), Chase (as a motorbike), Heatwave (as a race car), Boulder, Salvage and Blades (in his jet mode). None of the listings have any images, but all are set for unknown release except for Boulder and the second Bumblebee, respectively in stock and due in August. All figures are currently priced at $9.99, and you can access the listings below! Imagine helping Chase the Police-Bot save the day! As a sleek motorcycle, Chase is ready to go full throttle and race to the rescue! Imagine helping Heatwave the Fire-Bot save the day! As a slick race car, Heatwave the Fire-Bot is ready to roll to the rescue. Imagine helping Salvage save the day! As a formidable cement mixer, Salvage is ready to mix things up and roll to the rescue! Imagine helping Blades the Flight-Bot save the day! As a full-throttle VTOL jet, Blades is ready to scream through the skies to the rescue! Imagine helping Bumblebee save the day! As a sleek sports car, Bumblebee is ready to rev his engine and race to the rescue! Roll to the rescue with the Rescue Bots Flip Racers figures! Sized right for small hands, the Flip Racers vehicle converts from vehicle mode to bot mode in 1 easy step! Flip up the Speedster Boulder vehicle to convert it to bot mode. Flip it back down to convert it to race car mode and imagine speeding to the scene of a rescue! Robots and humans saving the day, working together the Rescue Bots way! So I guess the line hasn't been canceled or was it just those couple figures that one person contacted Hasbro about? 4,206 pages were recently viewed by 1,011 unique visitors. This page was viewed 1 times on Saturday, April 20th 2019 2:04pm CDT. © 2019 Seibertron, Inc. DBA Seibertron.com. All Rights Reserved. Established June 2000. Seibertron.com is owned by Ryan Yzquierdo.